French tosafist; lived at Touques in the second half of the thirteenth century. He abridged the tosafot of Samson of Sens, Samuel of Evreux, and many others, and added thereto marginal notes of his own, entitled "Gilyon Tosafot," or "Tosafot Gillayon." This abridgment, together with the notes, after undergoing many alterations and receiving several additions from later authorities, was called "Tosafot Ṭuk"; it forms the foundation of the Tosafot now printed with the Talmud (see Hillel ben Mordecai, 'Ab. Zarah, § 1295; Judah ben Eliezer, "Minḥat Yehudah," 58a; R. Nissim to Alfasi, Giṭ. viii. ; and Bezalel Ashkenazi, "Shiṭṭah," pp. 47-49). Gershon Soncino, who printed Eliezer's tosafot for the first time, says, in the preface to Ḳimḥi's "Miklol" edited by him (Constantinople, 1532-34), that he collected them in various places in France, especially in Chambéry, Savoy. 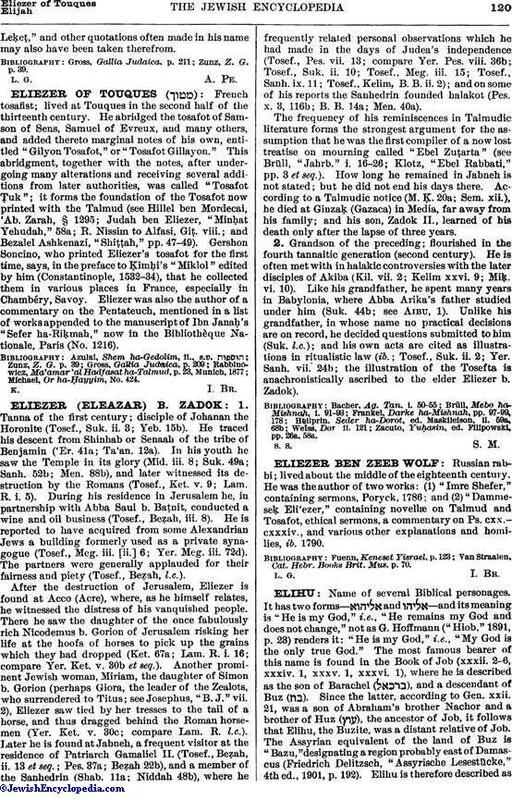 Eliezer was also the author of a commentary on the Pentateuch, mentioned in a list of works appended to the manuscript of Ibn Janaḥ's "Sefer ha-Riḳmah," now in the Bibliothèque Nationale, Paris (No. 1216). Michael, Or ha-Ḥayyim, No. 424.